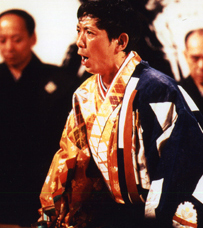 The Akira Shigeyama International Project, centered on Kyogen actor Akira Shigeyama, was founded in 1992 to promote Kyogen around the world, from Asia to the West, and deepen exchange through the universal theme of “laughter”. 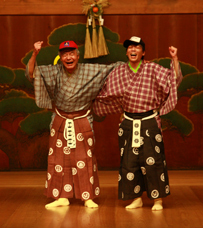 The project actively stages Kyogen performances overseas and promotes Kyogen in English. Besides Kyogen, the project also works with actors from the traditional European comedy group, Commedia dell’arte, to further spread humor in people’s daily lives. Warai no Za is a series of Kyogen performances targeted at children. The motto of the project is, through Kyogen and humor, to promote a peaceful spirit to raise children. It is hoped that children can appreciate with all their senses the “wonder of contemporary Kyogen” and perhaps they will be interested in Japanese culture in some way. Lectures and workshops are held in various locations around Japan from everything from Kyogen appreciation to chanting, movement and laughter. Paris and Kyoto, the two cities are renown as “beautiful capitals,” and this project hopes to create a new cultural thread between the two. 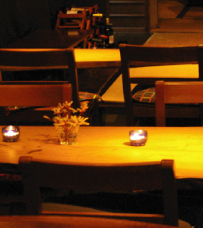 We pass along Kyoto’s Big Hits to Paris, and to the rest of the world. Finally it will come back to Kyoto in the end. 「Kyoto/Paris, 20 Stories of Cartier」is a project that sends out the various colors of cultural threads. At wine salon yu-an, various artworks are exhibited and displayed for sale. From the unique traditional machiya architectural space, different perspectives of appreciating art are born. * Exhibition terms and date differ according to exhibition.